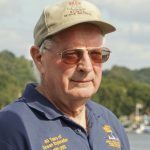 Hello, I’m Peter Taylor, I live in Southampton, UK, and before I retired, I was a research scientist at the National Oceanography Centre trying to determine the effect of the ocean on the atmosphere. Mainly it was to do with how the waves effect the wind by slowing the airflow down, and it meant going out on Research Ships into major storms. 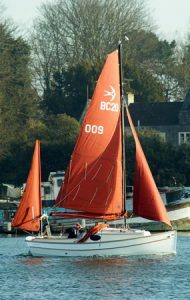 Since I retired I have become a National Coastwatch watchkeeper at Calshot Tower; I sail a Swallow Boats BayCruiser 20 called Seatern, and I still own a Seafly! 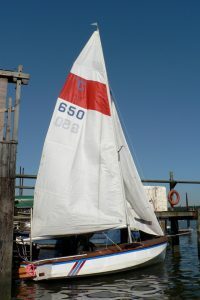 Sailing “The Dong” at Llanfairfechan, N. Wales. 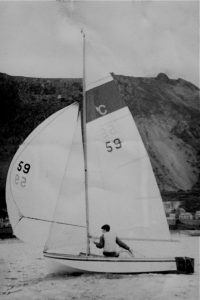 As a school boy in the 1960’s I sailed one of the first Seaflys, C59 “The Dong”, in sailing club races on the North Wales coast. It was built by my father from a South Devon Boatbuilders kit with help, or hinderance, from myself. That’s a young me in the photo, my father is to leeward adjusting the spinnaker. 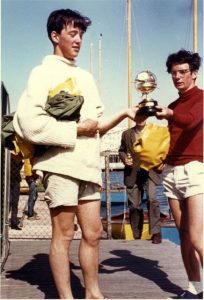 On one occasion I managed to pursuade my school Physics Master to allow me and my crew, Bob MacFarlane (left in photo) to practise for the 2nd North Wales Schools Sailing Association Championships (held in 1965 on the Marine Lake, Rhyl, North Wales), rather than doing a physics practical lesson! In a strong southwesterly wind we sailed the 4 miles out from Llanfairfechan to Puffin Island but, while planing back on a broad reach, a wave hit me and I slid overboard. I kept hold of the mainsheet, the Seafly dutifully stayed upright and turned into the wind, and I hauled myself back on-board. Can’t imagine a school allowing something like that nowadays. Anyway, in the championships we won the W.J. Jenkins Trophy (in the photo), despite the Marine Lake being too shallow to get the Seafly centre board fully down! More recently, when someone at the Oceanography Centre advertised a secondhand Seafly (C650 “Sonic the Seaslug”) for sale, I couldn’t resist buying it. However, since I kept it moored at my jetty on the River Itchen, maintaining the wooden decks was time consuming and I’ve now traded it in for an all-fibreglass “modern Seafly” (C2003 “Seafly Memories”), which I’m now happily sailing on the River Itchen (see photo at top of page).